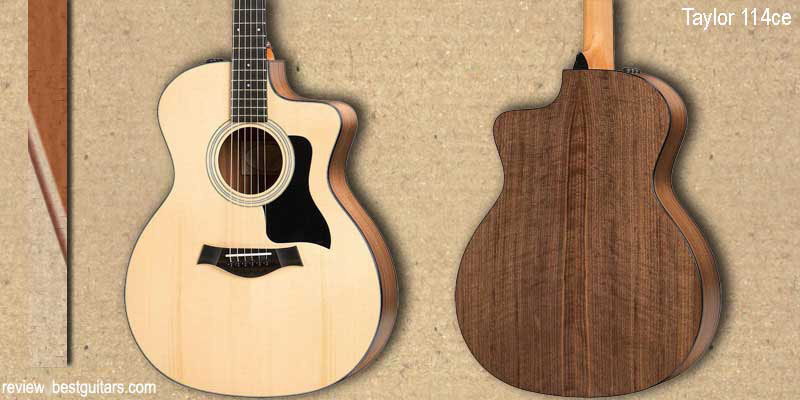 Who is the Taylor 114CE 100 Series Cutaway best suited to? This is not a beginner's guitar. The price point in the mid $800s suggests that students or beginners are priced out of the market. However its beautiful tone and patented pick up system make it a versatile guitar for accomplished and expert players. It has a relatively thin neck and fret board, making it particularly suitable for those who like to play finger style, as well as people with smaller hands. The cutaway makes the reach even easier. Anyone who wants a dual acoustic/electric guitar will find this a great choice. Taylor 114CE 100 Series Grand Auditorium six-string acoustic guitar has been given a makeover with the inclusion of the cutaway to the range. The solid, locally (US) sourced Sitka Spruce is the luthier’s choice for highly resonant playing for all styles including strumming and picking. 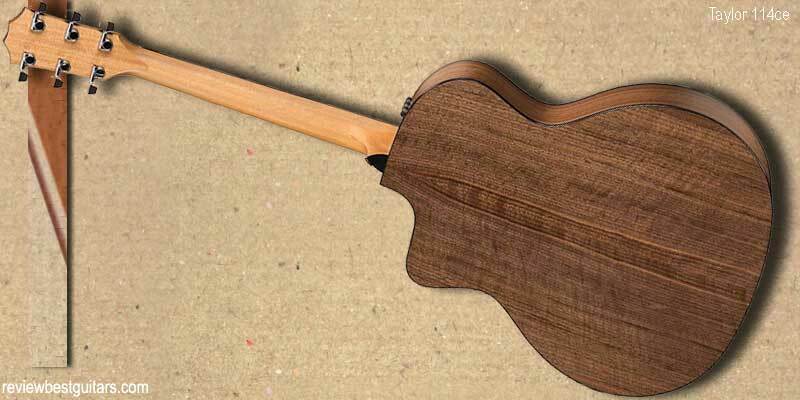 The inclusion of a Venetian cutaway allows greater range at the higher fret board notes. An attractive and classically styled acoustic/electric guitar. Taylor Guitars have been producing high quality acoustic guitars for over 40 years. Note that it only builds acoustic guitars and all guitars are produced in the California based factory. Taylor Guitars has been innovated the use of computer guided design and cutting, creating a uniformly rich and easy to play sound. Their guitars are beautiful to play and to look at. They produce a range of steel or nylon string acoustic guitars and offer tours of their factory to demonstrate their dedication to the instrument making craft. 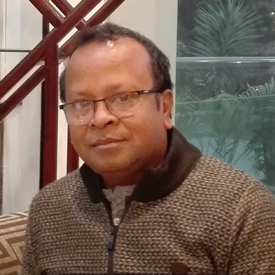 They are heavily committed to environmentally sustainable production and keeping local production jobs by sourcing locally grown timbers and other raw materials. Unlike many other leading guitar companies, Taylor has really kept a tight reign over the production and design of the guitars. They have innovated their pickup system, The Expression System 2 which has changed the placement of the sensors for the pickups to allow for greater resonance due to the vertical movement of the strings along the pickups. The Grand Auditorium shape of the Taylor 114ce relies on a solid Sitka Spruce top which gives it superior strength and agility due to the properties in the natural wood. The Spruce is sourced from North Western USA, and according to the experts at Taylor, it is chosen for its broad dynamic range. The back and sides are made from walnut laminate. The fingerboard and headstock are a combination of ebony and ebony overlay, with the neck constructed from Sapele. The bridge is genuine ebony, a strong and durable material. The tusq saddle allows great sound to emanate via the pickups and eliminates buzzing. It is a large acoustic guitar in a classic shape, but including a Venetian cutaway, providing a large slope to provide greater access to the higher notes. The pale solid spruce top contrasts with the dark ebony neck and headstock, which has the Taylor insignia proudly across the top in silver. The tuners come in chrome, once again setting off against the dramatic dark headstock. It includes a black pick guard with a 3 ring rosette surrounding the soundbox. It is only available in the Spruce/natural finish and not in sunburst or black. 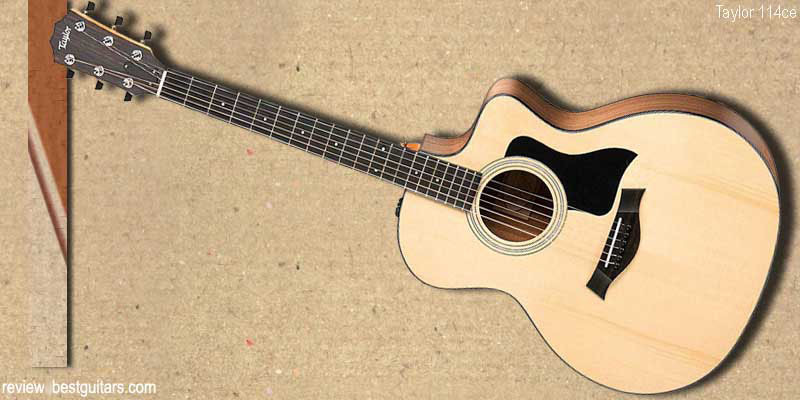 The easy to play Taylor 114ce guitar relies on the smaller size neck enabling easier formation of barre chords as well as for finger style playing. It has a lovely clean sound and its crisp voice is clearly reproduced without buzzing due to the innovative Expression System 2 pickups. It translates well onstage as well as in a home recording desk or in a studio. Taylor 114ce is a great classical or folk instrument due to its lyrical quality and projection. Performing artists of those who enjoy playing just by themselves will equally enjoy the dynamic sound and action. A right-handed guitar takes Elixir Phosphor Bronze Light Strings which produces a squeak free tone and longevity due to the Nan web technology that lightly coats them. It has an easy to plug-in jack point at the base of the guitar, as well as chrome strap buttons. 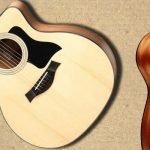 It is very hard to find any negative or nearly negative reviews by players about Versatile Sitka Spruce Cutaway Six-string Acoustic/Electric Taylor 114ce Guitar. The overwhelming comments are that the guitar has a lovely playing action that is a delight for any guitarist especially those with smaller hands. Comments also about the lightweight feel and beautiful sound, as well as the visual appeal of the solid spruce abound. One of the only negative comments relate to the use of a 9-volt battery in the pickup that can be difficult to change when it needs replacing. Players have commented that the strings are very easy to replace with the chrome mechanism really helping with the positioning while tuning. It is not the most affordable guitar, but as it is a premium product, made in California, not on some foreign production house it obviously will cost more. However, as the company prides itself on its high quality and pioneering manufacturing techniques, the finished product is clearly a labor of love. 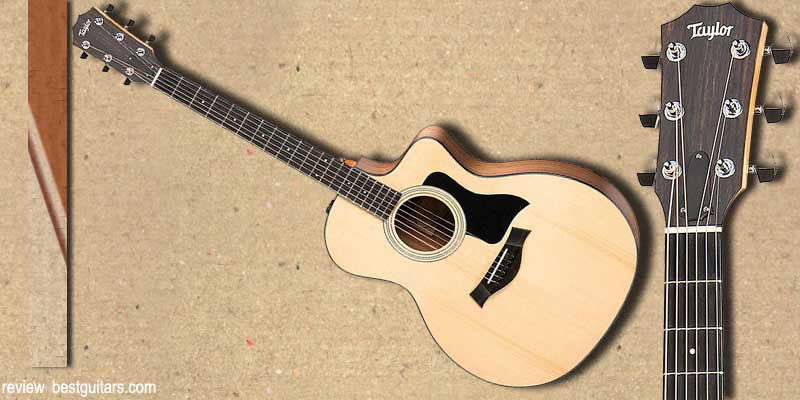 A comparison with a similar Taylor 114CE 100 Series style from a leading and reputable manufacturer would be the Martin Acoustic/Electric Dreadnought. Although both great choices in terms of playability, sound and cost, it has the slight edge due to the cutaway. The Martin in this range is more expensive but in a similar range.